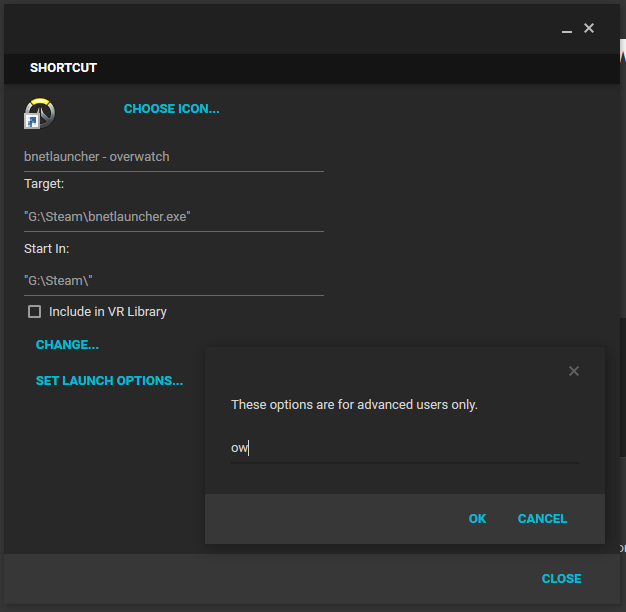 There’s many ways to add blizzard games to steam, but I’ve made bnetlauncher to be the simplest method while retaining the benefits of automatic login. Bungie has decided to implement anti-cheat mechanisms that also cause most overlays to not work as expected. See https://www.bungie.net/en/Help/Article/46101 for more information. If you need SteamController functionality https://alia5.github.io/GloSC/ is currently the best option. --timeout <seconds>, -t <seconds> changes how many seconds it tries to look for the game before giving an error (15 seconds by default). --leaveopen, -l leaves the client open after launcher the game. If combined with --notask option it will show you as playing on steam until you close the client. the directory where the bnetlauncher executable is located. A gamesdb.ini.sample is distributed with bnetlauncher containing a copy of the built in shortcuts. Important: Those defaults are not changeble. bnetlauncher will always override them with it’s internal gamesdb.ini file. However it is possible to create different entries with custom options. exe=BlackOps4.exe game exe that bnetlauncher will look for after launch, can use % as a wildcard ie Diablo III%.exe to support 32 and 64 bit builds of the game. nolaunch don`t directly launch the game but just open the client and try to find the game for an additional 60s this can in theory be used for hacky PTR support. Destiny 2 will not have Steam Overlay or any associate features when using bnetlauncher. This is intended by Bungie and cannot be fixed. Steam Input users can use https://alia5.github.io/GloSC/ to work around it. Enabling multiple instances of battle.net client in it’s options might break bnetlauncher functionality. Users of MSI Afterburner, Fraps and other overlay software might experience crashes do to incompatibility with their own overlay and steam’s, to solve the issue disable the 3rd party application overlay. The game, bnetlauncher and steam must all have the same running permissions to work properly, this means if one of them is running has Administrator/Elevated Permissions, then all of them must also be run has Administrator/Elevated Permissions. It’s not possible to automatically launch battle.net client PTR versions of games, the client provides no direct option to do this, however a workaround can be done by creating a new game entry and the nolaunch option and manually clicking play. Default launching the client trough a scheduled task may be incompatible with some setups, workaround is provided with notask switch/option. Starting multiple copies of Startcraft Remastered may cause bnetlauncher to show an error since the game only allows one instance to be run at the same time. internet coder Maruf for ghost tray icon fix code github Ethan-BB for the new parameters to launch games on battle.net. github RobFreiburger and iMintty for Starcraft Remastered and Destiny 2 support respectively. /u/fivetwofoureight for creating and allowing me to use his icon. /u/malecden, Maverick, /u/sumphatguy and others for their help pointing out bugs. Your Bnetlauncher is so usefull. All my friends are on steam, And I can finally use steam chat overlay in Sc2 and overwatch. I see on version 2 you can add more games. The instruction at “0x00007ffa06834ee7” referenced memory at “0x0000000000000fa0”. The memory could not be “read”. Never experienced crashing caused by bnetlauncher, so right now i’m unable to reproduce the issue. Check if you don’t have other overlay software that may cause instability when interacting with steam overlay or even aggressive antivirus software. OK, the bnetlauncher won’t work if DirectX12 is enabled in Wow. If i switch to DirectX 11, the bnetlauncher works fine. Steam doesn’t support DirectX 12 apps.